Dinner, last night. In an attempt to get as many vegetables into us as possible, I threw together a tart, crunchy, juicy salad of shaved purple carrots, chioggia beets, cucumbers and radishes, with wedges of first-of-the-season heirloom tomato, tender baby lettuce, and lots of snipped scallions in a lemon and coriander vinaigrette. 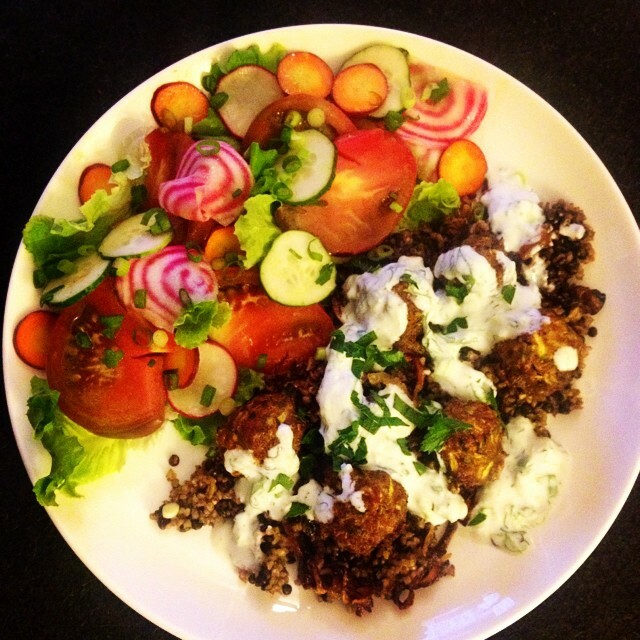 I added lots of shredded zucchini to my kofta-style meatballs, and served them on top of freekeh and lentils and crispy sweet onions, all of it drizzled with a goat yogurt tzatziki sauce. Bright flavors and colors for our dimly-lit late night meal, and a crappy camera phone photo for the record.